We’re excited to announce that version 1.5.0 of the QSun app is available on the App Store and Google Play! We’ve recently implemented an exciting new feature: the QSun Sunscreen Checklist. Have you ever been overwhelmed by the number of sunscreen products available on store shelves, and wondered which one to choose? Have you ever been in a rush and not had time to read the fine print on all of the labels? The QSun Sunscreen Checklist solves these problems. 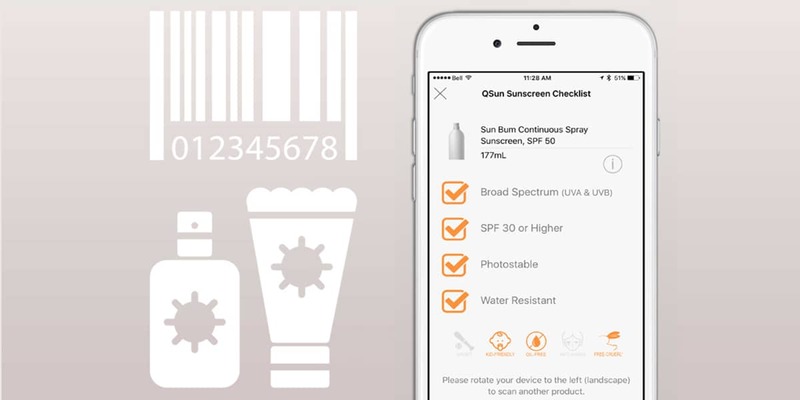 From the QSun app, simply rotate your phone to the left (landscape) and scan the barcode of any sunscreen. Don’t forget to turn off portrait lock first! The Sunscreen Checklist will automatically open, and will highlight key safety features of the sunscreen. The Sunscreen Checklist indicates whether or not a sunscreen offers broad-spectrum protection, has an SPF of 30 or higher, is photostable, and/or is water resistant. For your convenience, we have also added several icons at the bottom of the Sunscreen Checklist page, which outline the specific indications of the sunscreen, including whether or not it is good for sports, kid-friendly, oil-free, anti-aging, and/or cruelty-free. We hope that the QSun Sunscreen Checklist makes it easier for you to shop for sunscreens and to learn more about sunscreens you already have. We’re constantly updating our database to make the checklist as comprehensive as possible. If you find a sunscreen that we haven’t included, we’ve made it easy to suggest products through the app. Happy scanning!